Many volunteers have been involved staffing warming centers during the cold snap. While their work is winding down, there is always a need for more volunteers. INDIANAPOLIS — This week's cold snap brought out the best in many people who volunteered at warming centers and shelters in Central Indiana. Municipal Gardens on Lafayette Road in Indianapolis is a city parks facility that transitioned into a warming shelter on Wednesday and Thursday. 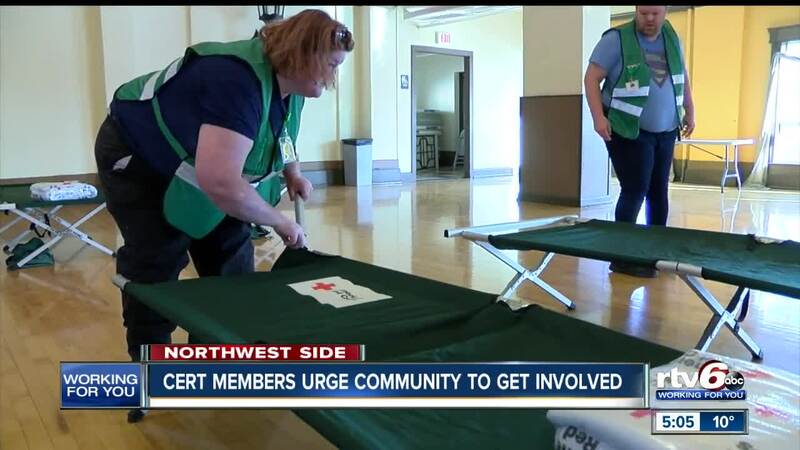 It was staffed by volunteers from the American Red Cross, Humane Society and the Marion County Community Response team, better known as CERT. Dozens of cots needed to be set up, food was brought in and there were even portable cages for pets. Kim Douglas, of CERT, says volunteers are always needed when weather events like the recent cold or even natural disasters strike. "It's very rewarding to be doing something and helping somebody else that may not be able to help himself, or they're in a situation where they lost everything, so just being there and helping them through it," said Douglas. Tara Drain was among those those who took advantage of the Municipal Gardens warming center. About the volunteers she said, "I think they were very helpful, very friendly, and it was just overall nice." If you are interested in becoming a CERT volunteer, the next training will be February 8, 9 and 10 at 201 North Shadeland Avenue in Indianapolis. You can register for free at: https://www.eventbrite.com/ and search for CERT basic training.